Protesters Ask: How Can You Shoot Yourself in the Head After Being Frisked and Handcuffed? On Sunday, protesters narrowly avoided a clash with riot police in Durham, North Carolina, when they took to the streets on the two-month anniversary of the mysterious death of 17-year-old Jesus “Chuy” Huerta. On Nov. 19, 2013, Huerta died of a gunshot wound while handcuffed in the back of a police car. The police ruled it a suicide, and last week, the Durham district attorney announced that, based on findings by the State Bureau of Investigation, no charges would be brought against the officer in the car. That isn’t enough for Huerta’s grieving family or for community members who view Huerta’s death within the lens of Durham Police Department’s long history of police brutality, racial profiling and lack of transparency. 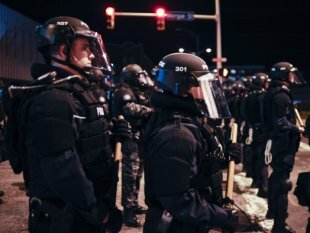 Their outcry has been met with further aggression from the police: on the one-month anniversary of the tragedy, officers in riot gear teargassed 150 demonstrators holding a vigil in downtown Durham. But DPD’s tactics did not deter demonstrators from gathering again on the two-month anniversary of Huerta’s death. At dusk on Sunday, a crowd convened outside Immaculate Conception Catholic Church, where an interfaith vigil for Jesus Huerta was scheduled for later in the evening. The rally was organized by a loose network of people unaffiliated with any particular organization. Rafael Estrada, one of the organizers, spoke through a bullhorn to the crowd. The crowd included youth of color who led the march, young activists from other parts of North Carolina and neighboring states, and Durhamites spanning generations. A few families with children in strollers turned out as well. An African American man explained in an interview that he and his mother were there because his younger brother was wrongfully imprisoned. He said that when police came to his mother’s house looking for his brother, he refused to let the officer in without a warrant. The officer pushed his way in and searched the house while shouting obscenities. According to the man, the officer refused, illegally, to give the family his name and badge number. When the man tried to take down the patrol car number, the officer blocked him, shining a flashlight in his face. The man said he attends the demonstrations held for Jesus Huerta as a way of standing up against the violence he and others like him face on a regular basis. 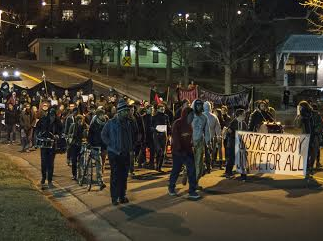 In calling for justice for Jesus Huerta, marchers called for an end to the criminalization of Durham’s youth. Part of the march’s purpose, it seemed, was for those youth to reclaim public space together, without fear. The group snaked through the neighborhoods around downtown Durham on a circuitous route toward the police station parking lot where Huerta died. People carried banners reading “Justice For Chuy, Justice For All,” “Jovenes Rebeldes Al La Calle” (“Rebellious Youth to the Streets”), “In life and death, stop criminalizing the youth,” and “Cops: protectors of the rich, hunters of the poor.” A young woman pushed a shopping cart with a speaker system blasting dubstep and hip-hop music, while others lit red flares that cast glowing pools of red light around the marchers. When four preteens flew down a side street on skateboards to join, the crowd erupted in cheers and the boys took their place at the front of the march, circling around and doing tricks like grand marshals of a parade. The atmosphere was exuberant until the procession reached the business district. Marchers were halfway down a deserted street between towering office buildings when a police van came squealing up to the next intersection. Riot police jumped out and assembled in rows, blocking the road. Behind the marchers, police had done the same, trapping the group between the two intersections. After a tense standoff, police behind the crowd backed away, and the group was able to retreat. Organizers decided to cut the music and quietly walk the rest of the way back to the church to attend the vigil. On the way back, several officers wearing gas masks cycled past, revealing that the DPD had prepared to use teargas again. As the crowd passed police headquarters, officers were stationed, weapons in hand, atop a low stone wall ringing the five-story glass building. Suddenly, a cavalcade of police on motorcycles blocked off the street around the parking lot entrance, making way for an armored truck and a white, unmarked school bus to zoom in without the dozens of arrestees they had apparently planned for. After the march dispersed, six young protesters were in a city-owned parking lot near the church when police arrested them on charges of unauthorized entry and unlawful assembly. The two youngest, below the age of 16, were released to their parents. Mainstream news outlets have falsely reported that the entire group of about 120 people were involved in breaking windows and spray-painting patrol cars, though no arrests were made based on these charges. No mainstream reporters actually attended the march. If the people responsible for the broken windows and painted cars were indeed affiliated with the march, they had separated from the larger group to take the actions they did. No mainstream outlets have reported on the police provocation that took place, or the group’s concerted effort to avoid an altercation. Now Durham Mayor Bill Bell and other city leaders are denouncing the monthly marches, called for by Huerta’s family, as a distraction from the search for answers in a perplexing case. The mayor told one local news outlet, “What gets the headline is the damage they’re doing, not the subject they protest in,” effectively blaming demonstrators for the limited scope of the mainstream media. The Huerta family has called for the marches to take place every month, on the anniversary of Jesus Huerta’s death, until justice is served. But so far, the case has only become more convoluted. On January 10, DPD held a press conference on the preliminary findings of an ongoing administrative investigation into Huerta’s death. According to the report, around 2an on November 19, one of Jesus Huerta’s sisters called 911 to report her brother missing. She told the dispatcher that he had been suicidal in the past. The dispatcher told patrol officers that Huerta had “no medical or mental conditions and was not at risk.” An officer came to the house and talked with Huerta’s mother. About 20 minutes later, Durham Police Officer Samuel Duncan and another patrol officer approached two teenaged boys on a nearby street corner. They discovered that one was Jesus Huerta and the other was his friend, Jaime Perez, though both boys gave false names at first. The officers also discovered, upon running the names through a police database, that Huerta had an outstanding warrant for trespassing. Duncan placed Huerta under arrest, handcuffing and frisking him before directing him into the back of a patrol car. Huerta had a backpack with him, which Officer Duncan placed in the trunk of the car. The other officer arrested Perez for obstruction of a law enforcement officer because he had given a false name. Perez was placed in a separate car and transported to the city jail while Officer Duncan headed to the police station to pick up the misdemeanor trespass warrant. At the station parking lot, a shot was fired and Officer Duncan jumped out of the car, calling for backup. Another officer came out, and after Duncan’s car stopped by colliding with a parked van, the two found Huerta dead in the backseat. A .45 caliber pistol was on the floorboard. It would later be traced to a Georgia pawn shop where it was last registered in 1991. The patrol car was equipped with a video camera that should have captured what happened. However, the camera had automatically shut off because the car was idle during the time prior to Huerta’s arrest. When Officer Duncan restarted the car, he didn’t log back into the system, which would have alerted the camera to turn on. The report concludes that Huerta was suicidal, but that this information had not been relayed to the officers. According to the report, they believed they were dealing with a runaway, not a suicidal teen. The Huerta family’s lawyer, Alex Charns, takes issue with this finding. He says that, although the dispatcher may not have told the officers that Huerta was at risk, tapes of the officers’ conversation reveal them discussing the fact that his mother was considering involuntarily committing him. “Under North Carolina law, in order to commit someone they have to be a threat to themselves and that threat has to be to commit suicide or to harm themselves,” Charns says. Therefore, reporting that the officers had no knowledge that Huerta was suicidal, “if not an outright lie, is deceitful.” For Charns, this undermines the department’s credibility with respect to other aspects of the investigation. This is important because of the tenuous nature of the report’s other main finding. DPD Internal Affairs concluded that Huerta had the gun on his person, but that Officer Duncan had failed to find it. The cause of his death, the report states, was a self-inflicted gunshot wound. But Charns says he took a statement from Jaime Perez, who was with Huerta for many hours that day. Perez claimed he had never seen Huerta with a gun, on that day or any other. When asked about Perez’s statement, Deputy Chief Anthony Marsh said he couldn’t comment while the investigation is ongoing. However, the Internal Affairs report included Perez’s account of the manner in which Officer Duncan frisked Huerta, which is part of the basis for the conclusion that the officer didn’t do a thorough enough search, and missed the gun. Then there’s the question of how Huerta, who was handcuffed, managed to shoot himself in the head. At the press conference, someone posed the issue to Marsh, who responded by showing a video reenactment staged by Arkansas police. In 2012, Chavis Carter, 21, died from a gunshot wound to the head while handcuffed in the back of a police car in Jonesboro, AR. His death was ruled a suicide. To support the claim the police created a video where several officers demonstrate pulling a gun out of their waistbands and pointing it at their temples while handcuffed. The state medical examiner’s report on the Huerta case was released on January 10, shortly after the DPD press conference. It found that the bullet which killed Huerta struck him in the mouth and exited the back of his head, rendering the Arkansas example irrelevant—if it was ever to be taken seriously in the first place. Charns says that between three and four in the morning on November 19, chief of police Jose Lopez texted Durham’s city manager with a speculative version of the events that had just taken place. The preliminary findings of the internal investigation offer the same scenario. On top of the questionable handling of the investigation, DPD has made such callous decisions as throwing away a memorial placed on a patch of dirt near the spot where Huerta died in the police station parking lot. The memorial included personal items of significance to the Huerta family, including handmade wooden crosses. DPD also chose to publicize the contents of Huerta’s backpack, which included items that had been reported stolen from his neighborhood. The department released this information nearly two months after reviewing the contents. Some view this as an attempt to tarnish Huerta’s image and deflect negative attention from DPD. Huerta’s case is among several high-profile cases in Durham over the last year and a half that were not met with accountability from the department. Jose Adan Cruz Ocampo was fatally shot by police officers as he attempted to hand over a knife. A police officer responding to a noise complaint brutally beat Stephanie Nickerson when she advised her friend of her right to refuse the officer’s request to enter the home. Carlos Riley Jr. is in prison because a police officer shot himself in the leg while stopping Riley for an alleged traffic violation. DPD remains under heightened criticism as more community groups and impacted citizens take up the issue of police misconduct. Officer Samuel Duncan is currently on administrative duty, pending the results of an Internal Affairs investigation that could result in discipline or termination if he is found to have violated DPD policies. Attorney Alex Charns says that public pressure led to the preliminary findings of the administrative investigation being publicized—normally this type of report is not a public record. City manager Tom Bonfield has called on DPD to complete the investigation as quickly as possible and is working with city council members to determine how much of the final report should be made public. As DPD’s investigation continues, Charns has asked the State Bureau of Investigation to extend its investigation to several key areas he identified as missing from the initial report. Meanwhile, the city’s Human Relations Commission is in the middle of a series of hearings on police brutality and racial profiling. The hearings were prompted by a set of policy recommendations presented to DPD last October by a local coalition called Fostering Alternative Drug Enforcement. Coalition members include the Durham NAACP, Southern Coalition for Social Justice, a cultural arts organization called SpiritHouse, and individual citizens and clergy. FADE’s eight-page entreaty cites data demonstrating that racial profiling occurs in Durham at a staggering rate. The commission will make a report to Durham City Council based on the hearings, though it isn’t clear when the public can expect that report to be issued. At that point, it will be up to council members whether or not to act on the recommendations. After Sunday’s march, protesters joined hundreds of community members at Immaculate Conception Catholic Church for a vigil. Church leaders led mourners in song and prayer. Evelin Huerta spoke through tears about her brother, imploring listeners to look past the incendiary headlines when they remember Jesus Chuy Huerta. People formed long lines, inching down the aisles toward the front of the sanctuary to light one of the dozens of candles placed there for Jesus Huerta. Evelin Huerta saw that Police Chief Lopez was lighting a candle for her brother. Astounded, she alerted march organizers and a group walked out of the sanctuary in protest. Evelin Huerta stood on the church steps crying, surrounded by supporters unsure of what to do. After a few minutes, the doors opened and a man in a reflective orange vest who had directed parking lot traffic earlier, ushered Chief Lopez and his wife out of the church. Their shoulders were hunched, their heads low, and the man in the vest escorted the couple with one arm outstretched. But there was no need to protect them; everyone was too dumbstruck to move. Maybe that’s when some people decided to head to the police substation with spray paint.